Rinjani Guide: Under terms of the Mount Rinjani National Park, where Guide and Porter is the main requirement Trekking Rinjani implementation process for both local climber and overseas. Realizing this, we accommodate local society who have skills in the field guide and porter who must already have licence and skills that are recognized by the national park office of Mount Rinjani. Currently we CV. Bas Rinjani Summit had 5 people Guide and 25 porters who are ready to serve and bring hikers who want to climb Mount Rinjani by using the services of our trekking organizer with the duties and functions of each. During the trekking rinjani underway, Rinjani Guide has the function of maintaining and coordinating the climbers and functions that are already commonplace in general, they will guide trekkers to climb Mount Rinjani or in other words that Guide is fully responsible for the security, comfort, and satisfaction of our customers. While porters or laborers pelvis has a very complex function, among others, they will be in charge of carrying accommodation and food needed during the hike Rinjani such as: Tent, Toilet tent, sleeping bag, food, mineral water and other beverages, trekking chair, mattresses, pillows, and other. Also, porter will play an important role in providing food during the ascent, both main meals or snacks and other coverings. So that trekkers will feel safe and comfortable during the hike Rinjani mountain. Known as Gunung Rinjani’s strongmen, porters are local Indonesian men who are tasked with carrying food, water and camping supplies for trekkers. Most of the porters are dressed in little more than flip flops, shorts and T-Shirts throughout the day. While the tour guides have the luxury to invest in proper trekking attire, most porters don’t. They are usually decked in threadbare shorts and slippers; some even walk barefoot throughout the journey. Even at night when temperatures drop to 10 degrees and the winds are ostensibly strong, the porters can survive the night with one jacket. Most of the porters are local Sasak men living in the nearby Sembalun and Senggini villages. The porters would have started working since their teens. Since there are not many jobs in Sembalun/ Senaru outside of the trekking industry, being a porter is considered a decent and well-paying job in Lombok. They earn USD250-300 on an average, excluding tips from trekkers. Using the most rudimentary kitchen tools, the porters can whip up delicious meals instantly. Most porters are trained in cooking and know how to make a myriad of local and western dishes. They usually cook banana pancakes for breakfast and local Indonesian meals for lunch or dinner. Despite being heavy smokers, porters have great mental and physical strength. They have big calluses on their shoulders from years of carrying a heavy load. They fasten their load with baskets tied to a bamboo pole and balance it on one shoulder, swapping to the other when they start feeling the strain. They generally do not stop until their bodies can no longer handle the pressure of daily hikes up and down Rinjani, with only a few days rest every month. 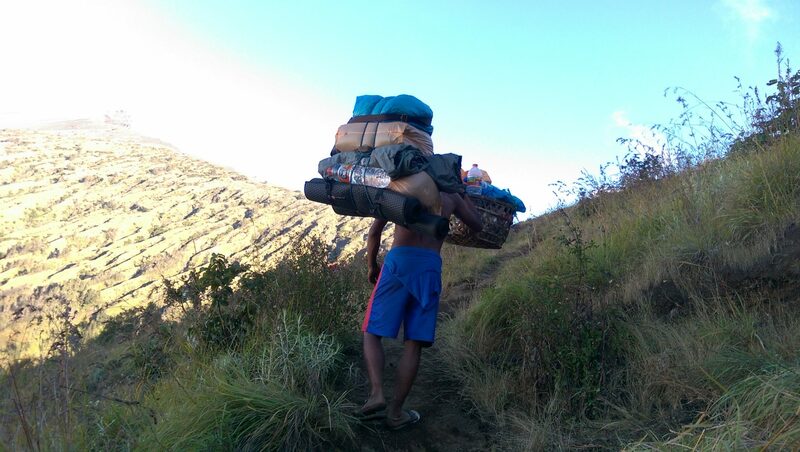 Porters and their families frequent Rinjani since young for a myriad of reasons; mostly for religious purposes. 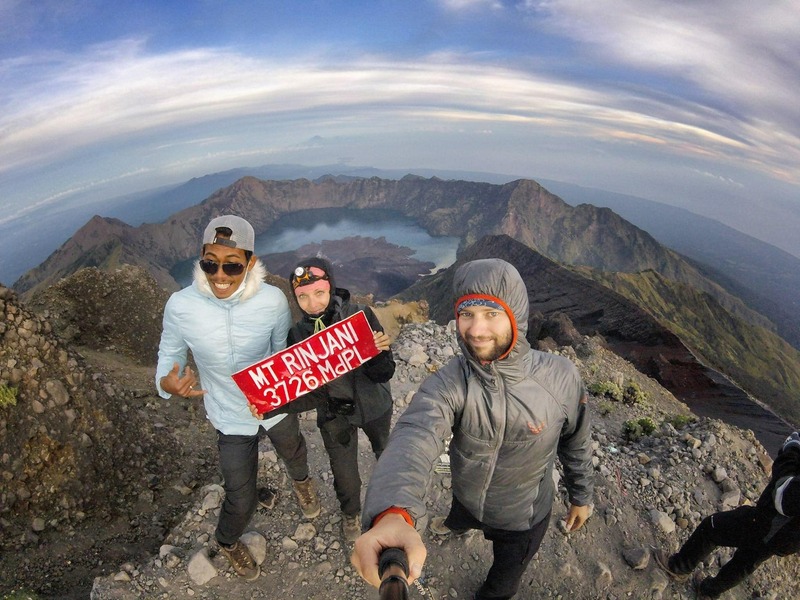 Some even proudly called Rinjani their ‘second home’. There is interaction and social solidarity among the porters and guides where they believe in helping one another. Some guides were porters before they became guides, hence the guides are empathetic towards the porters.